Need more flexibility than qualified plans allow? Non-qualified plans may be used in lieu of, or in addition to, qualified plans. The benefit of non-qualified plan designs is more customization, with less stringent requirements than the IRS or ERISA impose on qualified plans. A few key features include: the ability to target only those employees you wish to benefit; no contribution limits; no income limitations on tax benefits; long-term vesting periods; benefits tied to personal and/or corporate performance. These plans also allow flexible funding arrangements which can free up corporate liquidity and lower funding costs. When is the NQDC Effective? 1. When an employer wants to attract and hold key non-shareholder employees; an attractive deferred compensation package can be a substitute for equity-based compensation. 2. When an employer wants to provide additional deferred compensation benefits to an executive who is already receiving the maximum benefits or contributions under the employer’s qualified retirement plan. 3. When an employer wants to provide certain key employees with tax deferred compensation under terms or conditions different from those applicable to other employees. Employer does not need to offer this benefit to all employees, lest it become cost prohibitive. 1) Elective – These arrangements are initiated by employees who are electing to defer compensation that would otherwise be earned and received soon. They are normally set up as a percentage of the compensation to be earned and may have an interest factor to compensate for inflation. 2) Non-elective – these plans are generally known as “golden handcuffs” and are provided as a fringe benefit to retain key employees. They normally do not result in a reduction of the employee’s current salary or bonuses and generally come with a substantial risk of forfeiture. 4. Stock Appreciation (SAR) or Phantom Stock – no equity is used; share value determined by formula. To gain the tax benefits, the funds must be subject to “substantial risk of forfeiture.” There are 409A rules that need to be followed to gain the tax benefits allowed by law. 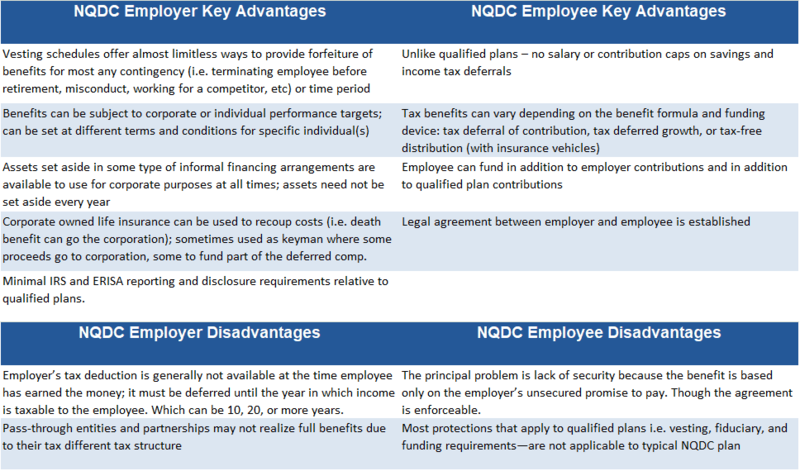 NQDC plans are either “funded” or “unfunded,” though most are unfunded because of the tax advantages they offer. An “unfunded arrangement” is one where the employee has only the employer’s “promise to pay” the deferred compensation benefits in the future. This means the promise is not secured in any way. In contrast, a “funded arrangement” generally exists if assets are set aside from the claims of the employer’s creditors, for example in a trust (like with 401k’s) or escrow account. What’s Required to Put a NQDC in Place? Specialized expertise is needed. Like qualified plans, there are legal, tax, and compliance issues. Typically, a legal agreement between employer and employee is put in place; and a third-party-administrator (TPA) and investment adviser are employed. With the flexibility these plans afford and the associated tax nuances, they can get complex. Different tax benefits apply depending on benefit formulas and funding vehicles, as well as depending on who funds the plan (i.e. employer, employee, or both). We work with you to orchestrate the expertise needed to help you structure a compliant, cost-effective plan tailored to meet your key objectives. Disclosure: Nothing herein shall be construed as investment, legal, or tax advice. You should always consult the appropriate professional to ensure compliance.